Measuring quality of life in diabetic neuropathy: generic, specific, or combined approach? What is the role of electrophysiologic studies in diabetes? How are neurons targeted by diabetic polyneuropathy? This is a unique compilation, by experts worldwide, addressing how diabetes impacts the nervous system. For example, diabetic polyneuropathy, a disorder more common than MS, Parkinson’s disease, and ALS combined, is a major source of disability to diabetic persons worldwide. This book addresses diabetic polyneuropathy and how diabetes alters other parts of the nervous system. Douglas Zochodne is a Professor with tenure at the University of Calgary in the Department of Clinical Neurosciences and the Hotchkiss Brain Institute. He trained in medicine and subsequently Neurology at the University of Western Ontario. He completed fellowships in Neuromuscular disease with Dr. Charles Bolton at Western and Drs. Phillip Low and Peter Dyck at Mayo Clinic. He served on faculty at Queen’s University, Ontario Canada then subsequently at the University of Calgary where he has worked since 1992. He is a consultant Neurologist of Alberta Health Services, Calgary zone and serves as the Director of the Neuromuscular Clinic (Adult), University of Calgary and as Director of Clinical Neurophysiology (Adult EMG). 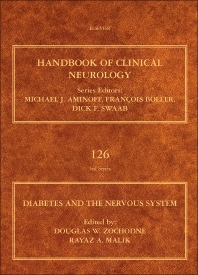 Dr. Zochodne served as Editor-in-Chief of the Canadian Journal of Neurological Sciences from 1999-2007 and President of the Peripheral Nerve Society from 2009-2011. His research laboratory has been externally funded since 1988 by CIHR, CDA, JDRF, NIH and other agencies. He has published work focused on the peripheral neurobiology of regeneration, experimental diabetic neuropathy and clinical neuropathies and has authored over 240 original articles, chapters and books. He was awarded the Wolfe Prize in Neuropathy Research by the American Neurological Association in 2011. His more recent papers, published in the Journal of Neuroscience, Brain and Nature Communications, identifies roles for tumour suppressor proteins in enhancing adult neuron regeneration. He has recently accepted an offer to Chair the Division of Neurology at the University of Alberta and will be moving with his laboratory to take up this new role in July 2014. Rayaz A. Malik is a Professor of Medicine at Weill Cornell Medical College, Qatar and Honorary Professor of Medicine and Consultant Physician in the Centre for Endocrinology and Diabetes, Central Manchester University Teaching Hospitals Foundation Trust and University of Manchester. He obtained his BSc., MSc. and MB ChB from the University of Aberdeen and his PhD from the University of Manchester. He is an expert in the pathogenesis, assessment and treatment of diabetic neuropathy and has been a co-editor for three books, co-authored over 30 book chapters and published (~130 peer reviewed papers) and presented (~500 national and international presentations) extensively. His research is funded by the NIH, JDRF, DUK, BHF and EU and his funding totals ~$8M. He was the Chairman of Neurodiab, the international study group of the EASD for Diabetic Neuropathy (2009-2012). He won the young clinical investigator prize for clinical science for Neurodiab in 1999, North West of England Medical Society Prize in 2000; North East Medical Society Prize 2012. He has been an invited lecturer for the American Diabetes Association 2003, 2007 and 2010, 2012, 2013; European Association for the Study of Diabetes 2004, 2007, 2008, 2010, 2012 and 2013 and World Diabetes Congress 2009, 2011, 2013. He is an associate editor for Diabetic Medicine (2006 to present); BMC Neurology (2009-present); Advances in Therapy (2009-present) and is on the editorial board for Journal of Diabetes and Its Complications (2012-present) and Journal of Diabetes Investigation (2012-present).